Today sees the publication of the Financial Conduct Authority’s (FCA) high cost credit review. “At Toynbee Hall we see clients every day who are struggling to buy food, heat their homes or pay their rent because they are overpaying on high-cost credit, with disastrous consequences for their mental and physical well-being. Too many people have to meet basic needs on inadequate and unpredictable incomes; we believe access to fair and affordable credit is a vital tool for helping people smooth out lumpy household budgets. We want to see a clear commitment from the FCA and government to regulating consumer credit markets to ensure fair outcomes for consumers, as well as creating a level playing field for alternative providers of fair and affordable credit. We no longer believe that competition alone can deliver fair pricing, so we want to see a fair cap on all forms of consumer credit to protect consumers from this kind of distress. We welcome this proposal, and will work closely with the FCA, and with partners (End High Cost Credit Alliance and End the Debt Trap Campaign) to contribute our own data and expertise to ensure a cap is set appropriately that leads to positive outcomes for current consumers of the Rent to Own market. It will be crucial to ensure the cap also applies to consumers with existing credit, not just new borrowing, so that people currently trapped in unfair contracts are also able to benefit and break free from the cycle of debt caused by high cost credit. 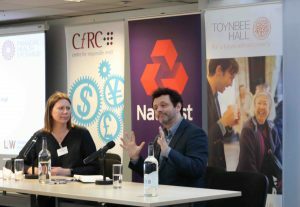 Sian Williams of Toynbee Hall and Michael Sheen, actor and founder of the End High Cost Credit Alliance at the Redesigning Fairer Financial Services Conference earlier this year. While we understand the importance of improving consumer financial literacy and choice, and the role that self-reporting from firms plays in ensuring compliance with existing regulation, we do not believe that the proposed measures for overdrafts, catalogue and store card credit and home-collected credit go far enough to improve consumer outcomes significantly. Responsibility should lie with providers to offer sound financial products, rather than placing the burden on consumers to be able to spot harmful products, particularly when we know that high cost credit use is often the result of life shocks and urgent financial pressures. At the point that people are most vulnerable, they should be able to trust that credit products are fairly priced and that credit providers are acting responsibly and in their best interests. That’s why we want to see the price cap, which the FCA’s own evidence shows has been effective in tackling consumer harm in the payday sector, extended to other forms of high cost credit. We will continue to work with partners to gather the evidence to make that case to policy makers and the FCA. More rules in the high cost credit market bring some improvements, but ultimately the proposals in today’s announcement do not yet go far enough to address the wider problem that the poor and financially distressed are paying more than is fair. We think that in principle nobody should pay more for credit than 100% of the amount they borrow. Evidence based on our own research has found that introducing a price cap and enforcing stricter rules on the payday loans market has resulted in better or positive outcomes for many consumers who otherwise felt that expensive and unaffordable loan products were their only option. We will continue to contribute our own evidence looking at the need for a sector-wide cap within the high cost credit market, working with partners to gather evidence and analysis to help shape a fair consumer credit market. We will also campaign for the growth in alternative credit provision, as well as a cross-range of organisations working to reduce the need for Britons to rely on credit where other measures might be more suitable. We know from our extensive work with social landlords, local government and others that the way they design and deliver their services can directly increase or reduce the need for credit. Many social landlords still move financially distressed families into empty flats at short notice and wonder why they turn to expensive rent to own companies for essential items such as a cooker and a fridge. We want all service providers to understand their role in driving customers towards credit, and improve their own delivery so that no one needs to rely on high cost credit to pay their rent or meet their family’s basic needs. And lastly, we call on credit providers to take a leadership role for their sector; fair prices, fair practice, and placing good outcomes at the heart of their business is the only way to demonstrate that they are making a net positive contribution to British society. We want to work with all credit providers who are ready to deliver a new level of excellence to consumers. The FCA High Cost Credit Review follows a Feedback Statement published in July 2017, identifying such key areas of concern as overdrafts, rent-to-own, home-collected credit and catalogue credit, and resulted in their decision to retain the cap on high-cost short-term credit (HCSTC), otherwise known as the payday loan cap, at its current level for a further three years. The End the Debt Trap campaign is a new coalition of organisations formed to put an end to the debt trap in which many people find themselves caught. Despite some positive steps forward, the FCA’s review on high cost credit will not End the Debt Trap says the coalition, because it does not limit the prices that can be charged and allows lenders to continue to exploit people in financial difficulties. Work by members of the coalition, including Toynbee Hall, and New Economics Foundation shows that there are currently record levels of consumer debt and weak wages – with people that need credit the most being targeted and paying an exorbitant cost for the credit they need just to get by. Meanwhile, wealthy and high-income households are privy to historically low levels interest. Households in the UK currently owe £1.6 trillion in outstanding debts, which is 13% higher than at the time of the 2008 great financial crisis. An estimated 7.6 million people owe the equivalent of at least a third of their entire annual incomes, and nearly 9 million people are spending more than a quarter of their income on debt repayments. The poorest are in the greatest financial difficulty. Just under half (44%) of all households spending more than a quarter of their income on debt repayments have incomes of less than £15,000 per year. The coalition proposes that the FCA need to extend the cap to all forms of credit, and help end unjust and immoral system, of predatory and exploitative lending where the poorest people pay the most to borrow. Further analysis from the New Economics Foundation shows that the poorest fifth of households with credit cards typically spend around 20% of their monthly income on credit card payments with middle to higher income households spend around 5-10%. The analysis, using the latest Wealth and Assets Survey, also shows that the poorest fifth of households who have personal loans spend around 14% of their monthly income on loan payments. Middle to higher income households spend around 5-8%, highlighting that the amount of monthly income spent on debt is doubly burdensome for the poorest households. The End High Cost Credit Alliance was founded in May 2018 by the actor and activist Michael Sheen. People need a fair, affordable credit product. Lenders need a fair, affordable credit product. The Alliance exists to bring fairness for the lenders and fairness for the people they serve. Our partners represent organisations who have a role to play in making this possible. Collaboration, maximising our collective resources and focusing on what works will enable our movement to deliver change that is long term, measured and pragmatic.